Neutral Density Filters (ND), recognized in the industry as "sunglasses for your system," are designed to reduce light intensity neuturally over a specific wavelength range without affecting image color or contrast. They also serve as a great solution for lens aperture control and reducing depth of field. ND Filters are available in both absorptive and reflective style options and can be used with monochrome or color cameras. With a MidOpt NS100 Neutral Density Filter Swatch Kit. 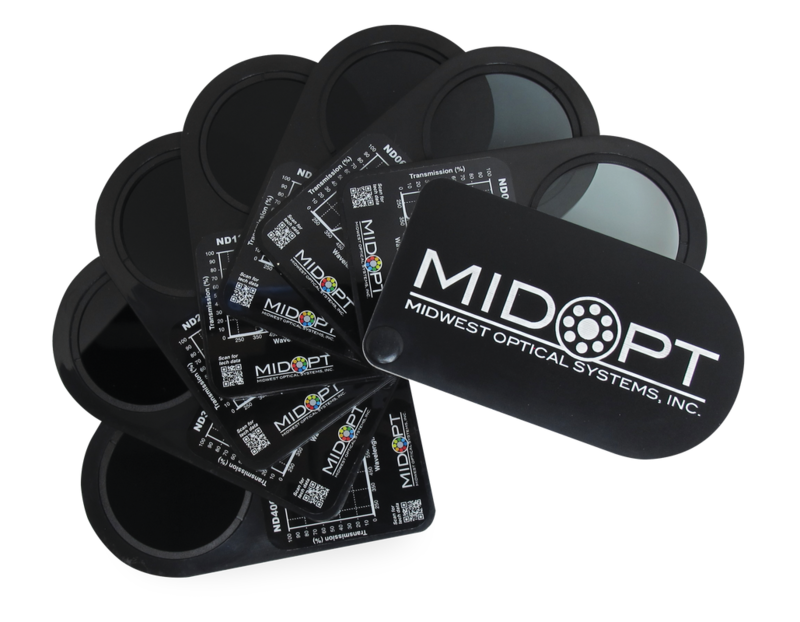 An ND Filter Swatch Kit allows you to stack MidOpt ND Filters to achieve a custom optical density and includes all of the most popular ND Filters. The NS100 is a great tool to have in the field or in a laboratory to test the effects of ND Filters, solve applications quickly and improve image quality.